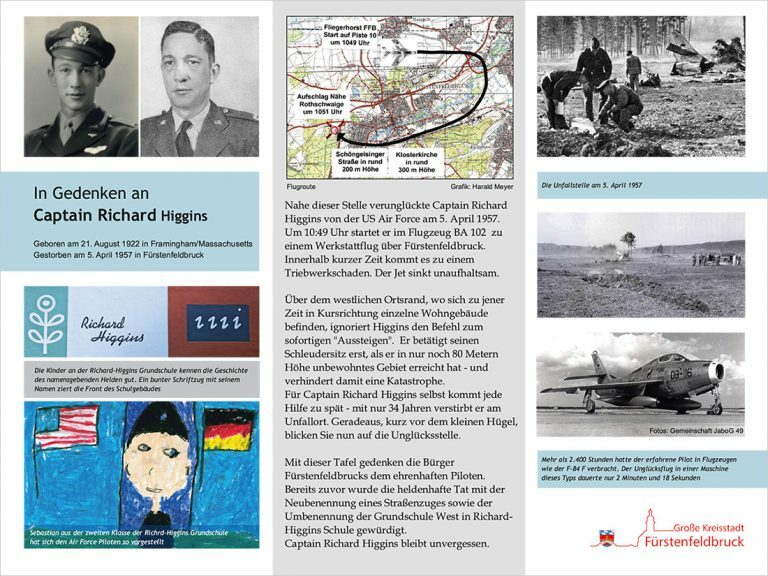 A plaque to com­me­mo­ra­te Richard Higgins, the hono­r­able US Air Force pilot who died in a pla­ne crash on 5th April 1957, was erec­ted by the citi­zens of Fürs­ten­feld­bruck. In ear­lier years, he had been hono­red for his heroic deed by naming a street after him as well as ren­aming the ele­men­ta­ry school Grund­schu­le West “Richard‐Higgins‐Volksschule” (Richard Higgins ele­men­ta­ry school). Cap­tain Richard Higgins will never be for­got­ten. On 4th April 2014, the ent­i­re Richard Higgins Grund­schu­le, 400 stu­dents and their tea­chers, set off to plot sec­tion 913, which is situa­ted next to the B471 and Cer­ve­te­ristra­ße. On the field path, a dele­ga­ti­on of the Bun­des­wehr hea­ded by Oli­ver Kem­mer­zell, com­man­der of the bar­racks and colo­nel Joseph Cory Lin­den, US liai­son offi­cer, as well as the stu­dents’ par­ents, grand‐parents, the press and mayor Sepp Kel­le­rer as the initia­tor of the memo­ri­al site gathe­red. The plaque was unvei­led in a cere­mo­ny with a per­for­mance by the brass band pro­ject group of the ele­men­ta­ry school.